Farm to Feet, makers of 100-percent American-made socks, has released a limited-edition sock in support of The Conservation Alliance’s, “We Keep it Wild” campaign. 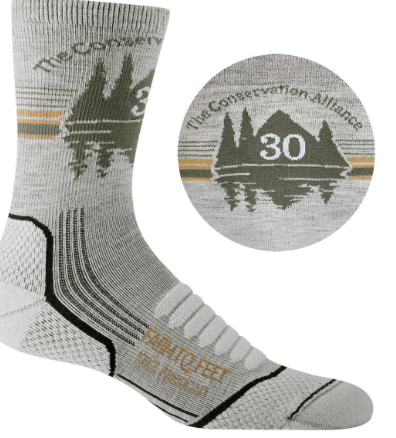 The sock that celebrates the organization’s 30th anniversary is available online through the month of April at www.farmtofeet.com. Modeled after Farm to Feet’s performance trail sock, the Damascus, the lightweight three-quarter crew features targeted cushioning, reinforcement zones and is made with ultra soft 19.5 mircon US merino wool. Knit into the shin area is The Conservation Alliance logo.